At Animal Dentistry and Oral Surgery Specialists, LLC, "we diagnose first and treat optimally". This is an opportunity to explain what is involved in a pet's oral disease or injury, and how pet owners might be able to help. 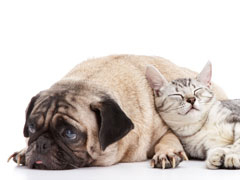 Dental and Oral Surgery Consultations are very valuable for pet owners. These consultations are our effort to team up with pet owners to recognize potential oral and dental problems in their pet. We discuss methods used to diagnose and treat various problems. The veterinary dental treatment cost estimates, and likely outcomes (prognosis), are also discussed. Owners can explain their concerns, fears and we will answer every question we can. We are never afraid to discuss fees and offer payment options if necessary. Risks of anesthesia and procedures, as well as, benefits and rewards are also discussed. Consider the veterinary dental and oral surgery consultation as a two-way interview. It is an effort to work together to provide optimal care for your pet.